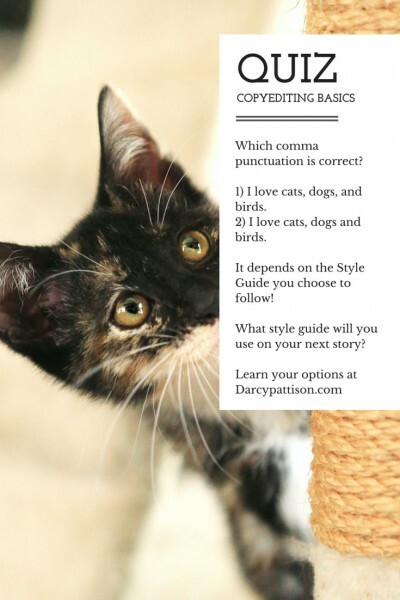 Here’s a question about punctuation, with an answer about style. Which of these is correctly punctuated? The answer is it depends on the style manual that you use. In school, you were probably taught certain rules about punctuation, and your teachers told you that the rules were the “right” way to punctuate. There were no options, no other ways of working. The reality is that punctuation conventions are just conventions that people agree upon. Two major style guides ar the Associated Press style guide, which is often used by newspapers, and the Chicago Manual of Style, often used by publishers. To make matters more complicated, often a publishing house will follow a “house style,” that is, they will decide that all of their books will follow certain punctuation rules. In the example above, the AP style would add that last comma, but the Chicago style wouldn’t. When my first book was published by Grennwillow/Harpercollins, of course, it went through extensive editing. I was shocked and embarrassed by the red ink that came back to me on the edited manuscript. In truth, I didn’t do so badly. They were simply applying the house style to my story. Copyeditors use a style manual as they edit. What does this mean for your story? Well, you have options. First, you could just write the best story you know how, copyedit the best you know how–and then trust your publisher’s copyeditor to finish the process. It works. Or, you could study one of the style manuals and stick with it strictly. For fiction, the best option is probably the Chicago Manual of Style. Learning a style guide down cold is technical stuff, and takes focus and an eye for detail; but it can be done. If you’re self-publishing, you can still choose one way or the other; the difference is that you’ll be hiring the copyeditor and will tell them what style to use. Personally, I’ll admit it: I don’t have an eye for detail necessary to be a good copyeditor. It would be painful for me to strictly follow a style manual. With each story, I learn more and more about things I should or shouldn’t do; however, I’ll never be perfect. Well, no one will be perfect–see this post on continuity goofs and other errors. But a good copyeditor can get your story pretty close to perfect. I let them do what they do best while I do what I do best, which is to tell a story. Be very sure: that’s not a copout. I’m not ignoring the issue of punctuation. Writers should take it seriously and know the basics and know when and how they can stretch the punctuation. One of my favorite books for learning basic punctuation is The Art of Styling Sentences: 20 Patterns for Success. Grab a friend and learn a new sentence pattern every week for twenty weeks. Practice the pattern that week by using it in emails back and forth, or in postings on FB or your fav social media channel. Great post, Darcy. I like Chicago Manual of Style. I don’t always check, though. I’ll be more careful in the future. Thanks. This is a great post, but I have to offer one correction. (Sorry!) In my Chicago Manual of Style, 16th Edition, section 6.18 actually does recommend using the Oxford comma, “since it prevents ambiguity.” I believe the AP Style is the style which does not require the comma before the conjunction. It’s never wrong to use the Oxford comma [unless your editor says so! :) ]…but it is sometimes wrong NOT to use it. It was inevitable that someone would jump in on this! Thanks for being my current Grammar Witch.